The local online advertising market is rapidly growing and remains largely untapped. However, client churn rates for companies that help small local businesses spend their advertising online (local search-engine-marketing [SEM] agencies) remain very high – 60% to 70% annually on average and higher than 80% for some of the smaller agencies. Churn is the per cent of clients that cancel accounts after a campaign with a local SEM. Sales companies want to keep these rates low. Hiring more internal salespeople versus contracting with local affiliates. Developing processes that enable salespeople to more efficiently and effectively manage a greater number of accounts at one time. Ramping up separate client service teams to improve client satisfaction. To be sure, the local online advertising market is so untapped – less than 25% of US small businesses have invested in SEM – that high churn rates won’t impact revenue growth for a long time to come. However, if these businesses are going to scale and drive healthy profit margins they need to decrease client churn significantly. Currently, we believe the average local SEM agency is not profitable with margins below 5% for those that are. Local SEM clients include doctors, lawyers, accountants and a number of service businesses. Why are they typically unhappy with campaign performance? Much of it has to do with the fact that less than half of the money they give to the agencies is actually spent on media buys. Many clients are unaware of this so their expectations are often not met. Agencies are pretty tight lipped about the percentage of funds they spend on media buying (the rest is spent on admin and compensation primarily). However, we estimate the average per cent of every dollar spent on media is about 45%. The range is fairly wide – from 30% for some of the smallest, lesser known, companies to 70% for a private company called BlitzLocal, which publicly discloses this information. We estimate ReachLocal spends about 45% to 50% of every dollar on actual media spend, which compares to about 35% to 45% for Marchex. These are two of the largest players in the space. 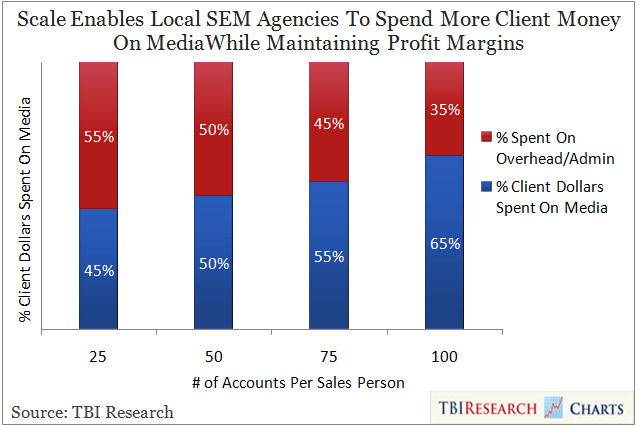 Most local businesses have a low ceiling on the amount of money they spend on advertising so SEM agencies need to find more efficient ways to manage a larger portfolio of accounts if they are going to achieve the scale necessary to drive profits. Some of this will involve better educating salesforces so they can work more efficiently with their accounts, but some agencies are developing client management software that makes this process more efficient and offers more reporting transparency to clients. Taking too much off the top, leaving less money for actual media spend. Not at all concerned with client retention, simply wanting to generate as many commissions as possible from deal to deal. For the most part totally uninformed about SEM, making them not all that helpful to clients once the deal was done. 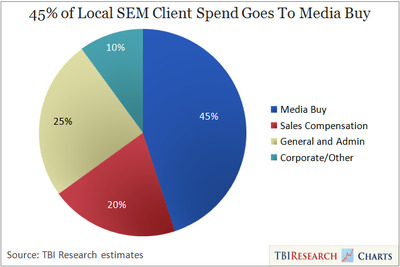 Most SEM agencies have addressed this by increasing their internal salesforces and educating them more about the practice of SEM in order to increase client satisfaction. For example, ReachLocal’s direct salesforce now drives 68% of the company’s revenue versus only 3% in 2006 (the remainder coming from affiliates). To be fair, some local affiliates are fairly high quality and can be as effective as internal salesforces. Unfortunately, once you get out of the major markets the number of quality affiliates drops significantly. If churn rates are going to improve, salesforces will need to focus more on retaining clients than on driving commissions. This is important because for SEM agencies a client typically doesn’t become profitable until it has been onboard for at least four straight months. Clients do need some hand holding during their campaigns – from simply walking them through how their campaign is performing and why, to helping them tweak landing pages to optimise performance. Since most of a local SEM salesperson’s compensation is tied to commissions and currently so much of the local online ad market is untapped, there is not much incentive for a salesperson to focus on client retention when commissions from a new deal are right around the corner. Companies have addressed this by hiring more campaign analysts and client service teams to help manage the account after the salesperson has moved onto the next deal.